Apple is premiering new technology. And that includes tools and features helpful to small businesses too. You’ll find details on these and other important small business stories in this week’s small business news and information roundup. Apple claims its new 5K Retina iMac has the best resolution of any digital display — ever. It might sound like an idle boast were it not for the fact that the company has some numbers to back it up. The new iMac’s Retina display contains a total of 14.7 million pixels, for a 5120 x 2880 pixel resolution. The latest update to the Apple operating system OS X Yosemite brings a new feature called “continuity” that officials say unites operation of the company’s iPhone and iMac. Think of it as a way to “hand off” active apps, documents, emails and even phone calls from your iPhone to iMac and back again. Lots of small businesses use televisions in their premises: gyms, sports bars, restaurants — to name some. But what business owners may not realize is that using consumer televisions for commercial purposes may void or reduce the warranty. And if you decide to use a TV or monitor to run an in-house presentation, say in your lobby, it can be cumbersome and expensive. As is true of so many things in life, the big boys have it a whole lot easier than the rest of us. Fishing for backlinks in exchange for money can be risky (not to mention deeply unethical), but that didn’t stop Hotels.com, an Expedia property, from sending out spammy emails asking travel bloggers for precisely that. If your small business wants more customer conversions (i.e. sales), then learning when and how to use autoresponders is a step in the right direction. These pre-scheduled emails, usually one or more in a series, are triggered by customer behavior and can be used to target, engage and convert prospects to buyers. According to a report earlier this year by ZenithOptimedia, global ad spending is on track to grow 5.5% this year to $537 billion, with Internet advertising expected to account for almost one-quarter of that, at $121 billion. Capital investment activity at non-corporate businesses has been declining for the past decade, data from the Federal Reserve’s Flow of Funds report shows. Between 2000 and 2011, the latest year data are available, the average non-corporate non-financial business reduced its gross fixed capital formation by one-third, when measured in inflation-adjusted terms. This decline is troubling. At an age when most kids may be thinking about the next new video game, Noah Cahoon, 13, was thinking of how to expand his father-son business, Paper Box Pilots. Recently, Cahoon was featured on the ABC pitch show, Shark Tank, where he was offered $35,000 for a full half of the business from Kevin O’Leary, a big name in the toy industry. There’s been plenty of debate over the last several years about the pros and cons of flexible hours for workers. But whether businesses think it is a positive or a negative, it’s a concept that is becoming more commonplace in workplaces around the world. In fact, the U.K. enacted a new law that allows workers to request flexible hours. Facebook can be an incredible tool for small business promotion. In fact, there are some businesses that have even built their entire marketing strategy around Facebook. The site offers so many different opportunities for both paid and free promotions that it can be difficult to know which tools will be the most effective. The holidays are quickly approaching, meaning less time to focus on the finer details of running your business and more time focusing on holiday shoppers. As a small business owner, you know the holidays are a crucial time to your bottom line. However, as many found out during the Polar Vortex last year, it is easy to lose a significant portion of those profits to high energy costs. Your employees are a big part of your business’s success story. So understandably you want to reward them and make them feel appreciated. That may include a special gift at that special time of year. So here is a list of 18 clever employee gift ideas for 2014. It’s a list compiled to fit a variety of small business budgets. With Halloween almost here, Black Friday, Small Business Saturday and Cyber Monday aren’t far behind. For small retailers, that means it’s time to gear up for your holiday marketing moves. Like last year’s, this is a short holiday shopping season (just 26 days between Black Friday and Christmas, compared to the more typical 31), so you’ll want to make the most of it. The post Top Stories: New iMac, Yosemite Update Premiered appeared first on Small Business Trends. 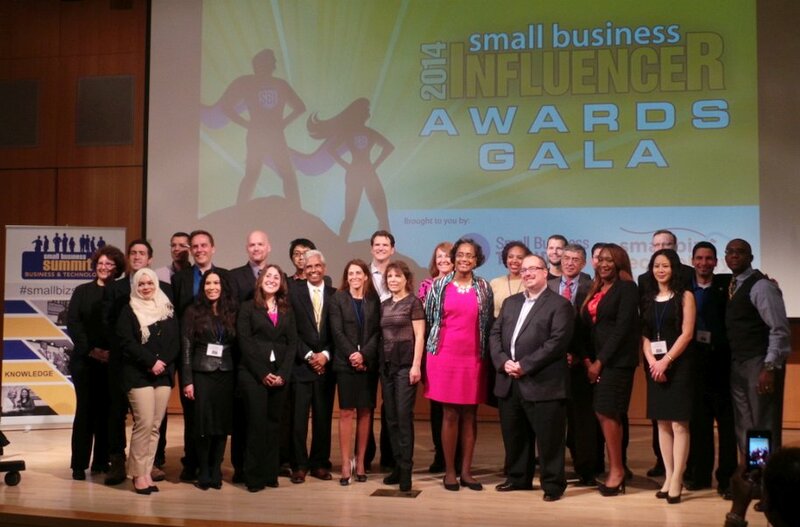 Small business owners, tech company executives, other people who support the small business community — all gathered last week for the Small Business Summit and the 4th Annual Small Business Influencer Awards ceremony immediately afterward. The two events were held at CUNY Graduate Center just down the street from the Empire State Building in Manhattan. The Summit each year is an educational event and this year had some of the most inspiring and interesting content we can remember in a long time! 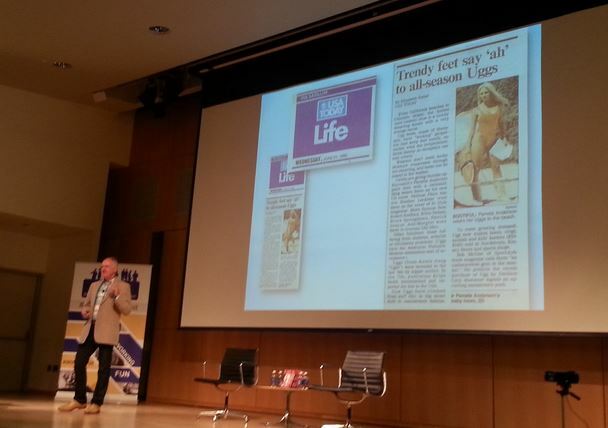 One highlight was the keynote by Brian Smith, founder of Ugg Australia and makers of the famous Ugg boots. It sounds similar to what small business owners go through, growing their own businesses. He spoke about how a USA Today story showing actress Pamela Anderson wearing the boots at the beach in her trademark red bathing suit put them on the map. And then there was Sarah Endline, CEO of chocolate company SweetRiot. Persistence and not taking “no” for an answer is crucial in a startup, Endline said. One of her best lines was to be relentless and politely persistent. “Some call it stalking,” she said, drawing laughter from the crowd. 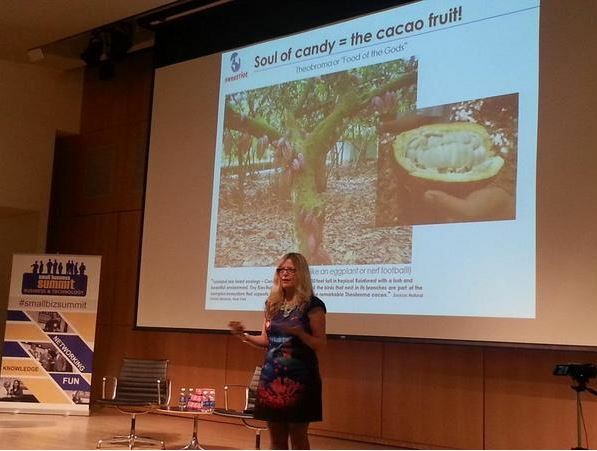 Endline, who is deeply and passionately involved in her business, spoke about the importance of visiting the cocoa growers who produce the fruit that is at the “soul” of chocolate candy. David Newman, author of “Do It Marketing” the Amazon bestseller, gave a great talk about what it takes to market successfully today. “Spray and pray is dead,” he said. 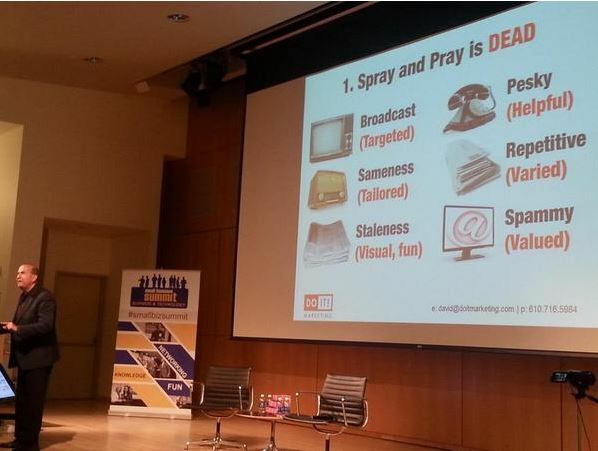 Newman talked about how marketing messages need to be targeted not broadcast; tailored not the same; helpful not pesky. Then there was the “battle” pitting two gigantic competitors against one another. Google vs. Microsoft featured Michael Spadaro of Profound Cloud, a Google Apps Partner, and Melanie Glass of MicrosoftPrincess, a Microsoft partner. The session was a bold gutsy move. It was fun, but also included some real jabs especially about privacy. The two differed on several subjects. At one point the Microsoft representative touted how Microsoft supported a Massachusetts bill against using data collected from kids on computers at public schools. One attendee, Alex Yong, pointed out that more events and speakers “need to take risks” like this session because it was so memorable. At the Awards gala,Top 100 Champions came from across the country to be honored in the Big Apple. Included were entrepreneurs and small business owners as well as representatives from big names in the small business industry such as Cisco Small Business, Hiscox Insurance, Sage, VistaPrint, Constant Contact, and the Dell Entrepreneur Center. Top 100 Champion Tiffany Gillespie, who runs an events planning and catering business, came to accept her award with a special guest — her mom! Mom got a rousing ovation — and the evident pride pointed out how significant this event is to the winners. 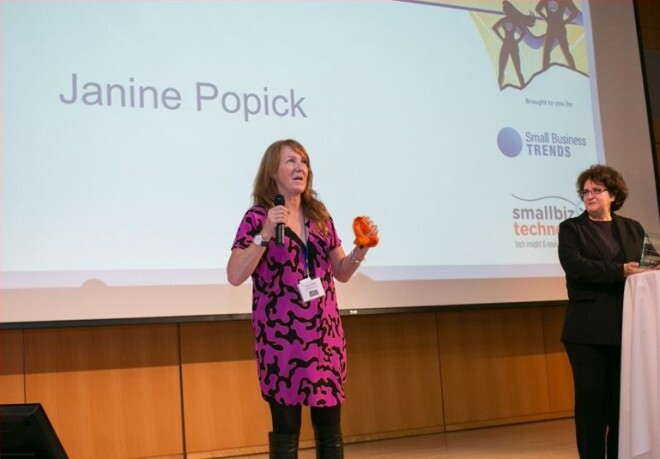 Multiple year winner Janine Popick, who founded Vertical Response (sold to Deluxe) email marketing company, also attended in person along with her husband to accept her award. Ivana Taylor, Marketing Leader for the Awards said one of the highlights was honoree Carol Wei, founder and president of the Mid-America Asian Culture Association. Wei spoke of the importance of women in the sciences — to considerable applause. 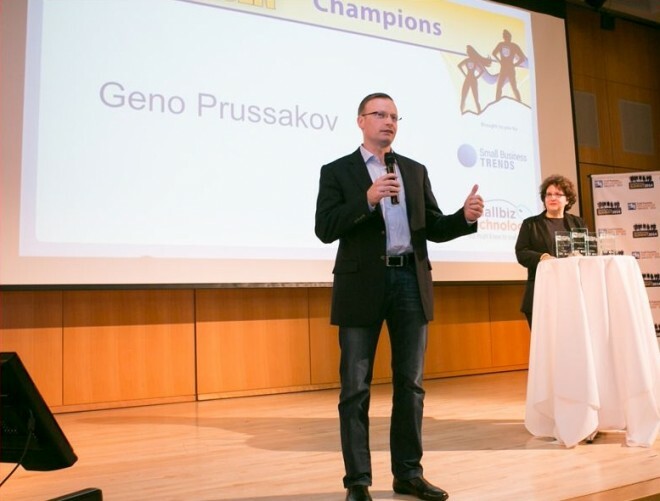 Geno Prussakov, Founder and Chair of Affiliate Management Days, another Top 100 Champion, told a moving story from his childhood in Moldavia, which he called “one of the poorest countries in Europe.” Prussakov, an immigrant to the United States, remembered a story told by his father and likened it to how small business owners operate with dogs barking at their heels all the time. The event was more than just about handing out Awards. It was a recognition of the hard work and contributions of small business owners, solo entrepreneurs, vendors, journalists and other influencers on the small business community. 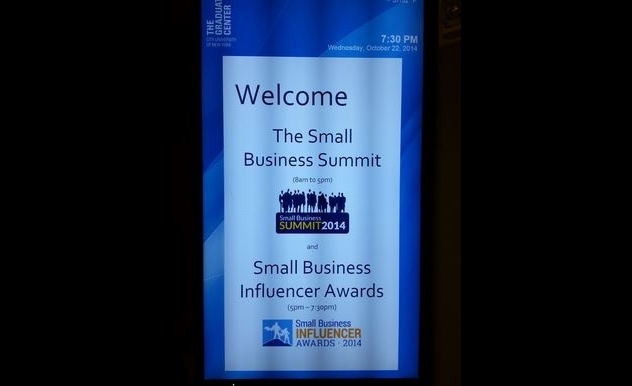 The Awards gala is a joint production of SmallBizTechnology and Small Business Trends. Ramon Ray, CEO of SmallBizTechnology and Anita Campbell CEO of Small Business Trends presided as masters of ceremony for the event. See the full list of Top 100 Champions winners and the Community Choice honorees. See also the press release about the Awards. The post See What Happened at the Small Business Influencer Awards and Summit appeared first on Small Business Trends. Bulgaria’s state-owned National Electric Company (NEK) has reported a loss of BGN 425 M for the first nine months of 2014. NEK’s loss has increased by 275,2% year-on-year, according to a financial report of the company, as cited by econ.bg. At the end of June 2014, NEK reported a loss of BGN 250 M.
NEK says that the power price hikes introduced on July 1 and October 1 will not suffice to stabilize the company. NEK blames the poor results on the pricing policy of the State Commission for Energy and Water Regulation (DKEVR), the obligation to buy larger quantities of expensive electricity, and the increasing number of consumers switching to the free market. “In the first nine months of 2014, the company keeps functioning against the backdrop of unfavorable pricing and economic conditions, at the same time absorbing all financial drawbacks and shouldering the entire commercial risk on the electricity market,” NEK states. The 21.6% year-on-year decrease in the output of hydropower plants has also contributed to the poor condition of the company. According to the report, Bulgaria is plagued by a surplus of electricity and hydropower plants are unnecessary. NEK reports a 4% year-on-year decrease in purchases of electricity. NEK informs that the surplus of electricity forces it to pay a higher price to US-owned thermal power plants AES-3C Maritza East 1 EOOD and Contour Global Maritsa East 3. In the case of a surplus of electricity, when the two TPPs are not functioning, NEK is obliged to pay them for their availability. According to the financial report of NEK, the purchase of electricity produced by the Kozloduy nuclear power plant, which is cheaper, drops by 21.8%. As a result, the price of electricity on the regulated market increases, causing the number of companies switching to the free market to jump by 75% on the year. The post Hundreds Support Small Business Influencer Awards appeared first on Small Business Trends. NEK informs that the surplus of electricity forces it to pay a higher price to US-owned thermal power plants AES-3C Maritza East 1 EOOD and Contur Global Maritsa Iztok-3. HAVING successfully passed the European Banking Authorty’s stress tests on October 26th, several British banks announced their quarterly results this week. Their home country’s booming economy might have been expected to have produced large profits for them. But the picture was in fact much more mixed. Although the domestic market for financial services has perked up, they have been battered by a seemingly never-ending list of fines for bad behaviour. And new rules on leverage, announced by the Bank of England on October 31st, are likely to drag down shareholders’ returns even further. The refugee center in the western village of Kovachevtsi will be closed, according to Nikolay Chirpanliev, Chair of Bulgaria’s State Agency for Refugees. In an interview for Presa daily, Chirpanliev says that the authorities will have to move some 100 people, who currently live there, to other centers. Chirpanliev explains the decision with the unbearable heating bills amounting to tens of thousands of leva. In his words, the site, built before 1989, is difficult to heat, with 3-4 people sleeping on an area of 90 square meters. He admits that the tensions over the protest of locals against refugee children attending classes at a school in the locality are also among the reasons behind the decision to close the refugee center. The closure of the site by October 31 was requested by Kovatchevtsi Mayor Vasil Stanimirov and municipal councilors several months ago. In a few months’ time, three leading outsourcing firms will open offices in Bulgaria’s Plovdiv. Representatives of Scale Focus, 60К and UNIFY announced at a conference titled “Outsourcing Destination Bulgaria” in Plovdiv on Friday that they had picked the city due to the combination of universities, affordable office rental rates, and the support of the municipal authorities for the launch of their businesses. 60K said it was planning to open an office in Plovdiv in the beginning of 2015 with a staff of 100, with plans to increase the headcount to 150-200 by end-2015, , according to mediapool.bg. Stefan Stoyanov, Deputy Mayor of Plovdiv, suggested that the demographic indicators, the strategic geographic location, the high quality of life, and the well-developed educational system made Plovdiv the second most attractive investment hub in Bulgaria for IT and business process outsourcing. He claimed that the fact that Plovdiv had won the title European Capital of Culture 2019 made it even more attractive for investors. The participants in the forum discussed the difficulties which outsourcing companies in Bulgaria were facing, including the lack of skilled employees, and the ensuing need for educational reform. The participants in the event agreed on the need to boost cooperation in the sphere of project development and to attract university lecturers with experience in the sphere of industry. They also exchanged views on opportunities for retraining and hiring foreign employees, as well as proposals for changes to high school programs. The conference was organized by the Plovdiv Municipality and Industry Watch in cooperation with the Bulgarian Outsourcing Association, the InvestBulgaria Agency, the ICT Cluster Plovdiv and the Bulgarian Association of Software Companies. Entrepreneurs live with uncertainty. Small business owners live with uncertainty. After I left a good job to go on my own, my wife and I built a business and raised five kids without ever really known where the money would come from three or four months in the future. We survived and even, over the long term – thrived. Things worked out for us. My wife and I are still married and our kids are grown up, educated and productive. We would never have gotten there if we’d been unable to jump and hope. Fair enough and understandable. But here’s the thing. Having that high security need means you can’t take chances. And not taking chances means you’ll never have the satisfaction of building your own business. You won’t be able to create something and see it grow. You won’t control your own destiny. I’ve consulted with some large companies where some smart “office-politics-savvy” people could hide in the corporate woodwork so-to-speak, to keep steady employment without much risk. However, they weren’t creating anything or making changes or taking risks. They weren’t getting any satisfaction – only money – and not that much. People who lead in larger company settings are at as much risk, in the best cases, as entrepreneurs. It’s just that they don’t know it. I had friends whose booming fax board business was killed overnight when Microsoft bundled fax software with Windows. And acquaintances whose GPS-based businesses are dying because cell phones do navigation for free. The people in those companies thought their jobs were safe. At least entrepreneurs and small business owners know they aren’t. Don’t trust facts. Don’t let the research make your decisions. All business decisions are guesses. Survey results are just as likely correct, as much as they are also likely incorrect and able to lead you astray because the research was done wrong. The focus group is likely to provide correct conclusions, just as much as they are also likely to give you the wrong conclusions because one charismatic person led the group wrong. Look at so-called facts as basic. Much like whether sugar, eggs and butter are good for you or not. The answer depends on which generation you ask – or what the latest research was. Don’t get me wrong. I love having the research. I really love having data to help me decide which way to go. But the trick is to use the data – and not necessarily always just blindly believe it. Don’t trust it. Always look for the flaws and always subject it to common sense tests. Once I was in a meeting going over the analytics of a landing page. The group poured over the data, hot spots and back-end analytics trying to figure out why the landing page wasn’t performing. Finally the marketing lead, who was running the meeting, threw her hands up in frustration and asked, “Doesn’t anybody see how ugly this page is? Would any of you linger on this page?” The answer was no. She turned the group back to the fundamentals behind the analytics – and that new revision performed better. This one brings me back to why I do believe in business planning. I’ve always dealt with uncertainty by breaking it down into smaller pieces. When I first left my market research job, I had a plan that listed possible jobs for possible clients and that – although none were certain and only some came through – made me more comfortable. I can’t imagine jumping into a startup without a sales forecast and expense budget. But neither is likely to be right. It’s breaking sales down into units, prices per unit, channels, product lines and types of clients that makes the sales forecast manageable. Expenses in a startup business plan’s budget are guesses. But they should be educated guesses that are based on experience and asking the right questions. Business planning is always uncertain. But it creates a system of connections and assumptions that can break the big vague uncertainty of a new business into pieces you can look at, one by one – and live with. My wife and I are lucky. We matched in this. When I said, “I think I can” she said, “Do it.” And added that, “If you fail, we’ll fail together.” If you don’t match, that’s a real problem. It can kill your relationship – so be sure of your priorities. The post Teachings About Fear and Uncertainty in Business – Maybe? appeared first on Small Business Trends. You are currently browsing the Business, finances, forex blog archives for October, 2014.